Don’t let the cold weather keep you from enjoying the season. 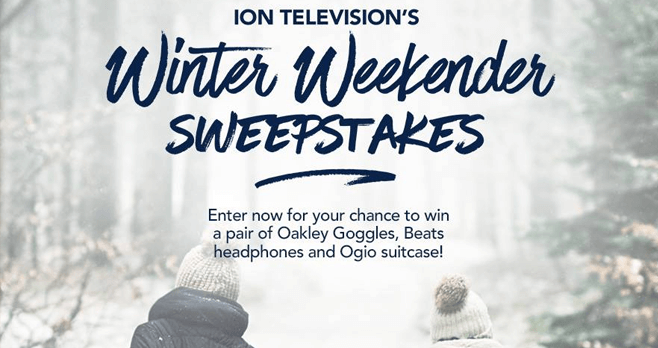 Go to IONTelevision.com/WinterSweeps now and enter the ION Television Winter Weekender Sweepstakes for your chance to win a prize package that will help you get out in the snow. One lucky viewer will receive a pair of Oakley goggles, Beats headphones and Ogio suitcase. A grand prize valued at $2,500. Are you ready to win? What You Need To Know About The ION Television Winter Weekender Sweepstakes At IONTelevision.com/WinterSweeps? Eligibility: The ION Television Winter Weekender Sweepstakes is open to legal residents that physically reside in the 50 U.S. or the District of Columbia and are the legal age of majority in the jurisdiction in which they reside (and at least 18 years old) as of date of entry. Sweepstakes Period: Starts on January 30, 2017 at 10:00 a.m. Eastern Time (“ET”) and ends on February 9, 2017 at 11:59 p.m. ET. Limit: Limit of one entry but each entrant may also receive additional entries by completing various actions. Random Drawing: One prize winner will be selected in a random drawing from all completed, correct and eligible Entries on or about February 10, 2017. Grand Prize (1): One (1) pair of Oakley Goggles, one (1) pair of Beats Solo2 Wireless Headphones, and an Ogio Suitcase. Approximate Retail Value of the Prize is $2,500.00. Winner’s List: The name of the prize winner will be available after February 30, 2017 at http://iontelevision.com/contest-winners for a period of at least 30 days. Sponsor: ION Media Entertainment, Inc., 601 Clearwater Park Road, West Palm Beach, Florida 33401. For more information on the ION Television Winter Weekender Sweepstakes, including official rules, visit iontelevision.com/wintersweeps now!